Be the first to share your favorite memory, photo or story of Willis "Bill". This memorial page is dedicated for family, friends and future generations to celebrate the life of their loved one. 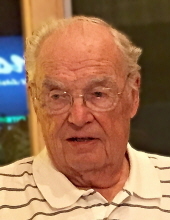 Willis (Bill) Virgil Johansen, 93 of Iowa City passed away surrounded by his family on Thursday November 29, 2018 at Melrose Meadows Assisted Living of Iowa City, Iowa. Bill was born on September 16, 1925 in Fresno, California, son of Eric and Viola (Waldemar) Johansen. Upon graduation from Fremont High School in Oakland, California, he entered the US Army Air Forces, serving for two years during World War II. When the war ended, he enrolled at Dana College in Blair, Nebraska. After two years, he transferred to California State University – Fresno, where he completed a B.S. Degree in Mechanical Engineering. At Dana College Bill met Beverly Clausen. The two fell in love and were married August 31, 1950 at Resurrection Lutheran Church in Racine, Wisconsin, where they attended for 40 years. During that time, he was a Sunday school teacher, sang in the choir and attended many bible studies. He served as church treasurer and two terms as church president. During his long professional career in Racine, Wisconsin, he worked variously as an engineer at Modine Manufacturing Company, J I Case Company and the last twenty years as Chief Engineer at Young Radiator Company. He also earned the certification of Registered Professional Engineer – State of Wisconsin. His whole adult life was lived with the precision of an engineer! In 1993 after Bill retired, he and Beverly moved to Iowa City, Iowa to be near family. They became members of Parkview Church and were active in various areas in the church. Bill knew Jesus Christ as his Lord and Savior and was ready to spend eternity with Him. Bill was a devoted family man. He was an avid golfer at Meadowbrook Country Club in Racine and Brown Deer Golf Club in Coralville. He had multiple hole-in-ones and continued to work on his game until the last months before he died! He enjoyed playing bridge with his men's group in Iowa City and with Beverly when in California visiting his son. Bill is survived by son Brad (Patricia Hammer) Johansen of Roseville, California; daughter Barbara (Dr. Erling) Larson of Bettendorf, Iowa; grandson Matt (fiancé Chelsey Thomsen) Larson of Englewood, Colorado; granddaughter Kristen (Brett) Cimorelli of Dallas, Texas; great-granddaughters Amelia and Hannah Cimorelli of Dallas, TX; sister Leila Nielsen of Diamond Springs, California and family; brother Russ (Sarah) Johansen of Clovis, California and family; sister-in-law Jean (Lloyd) Johansen of Coralville, Iowa; niece Jann (Dr. Lanny) Kampfe of Iowa City, Iowa and family; nephew Judd Johansen of Coralville, Iowa. He was preceded in death by his parents, his wife Beverly, brother-in-law Ray Nielsen and his son-in-law, Kevin Ahern. Meadows Retirement Community and Iowa City Hospice for their compassionate care. A memorial service will be held on Saturday, January 5th at 1 p.m. at Parkview Church, Iowa City. Inurnment will be at Veterans Cemetery, Union Grove, Wisconsin at a later date. To send flowers or a remembrance gift to the family of Willis "Bill" V. Johansen, please visit our Tribute Store. "Email Address" would like to share the life celebration of Willis "Bill" V. Johansen. Click on the "link" to go to share a favorite memory or leave a condolence message for the family.